Starlit RGB Pro LED Dance Floor Hire - New Colours & Effects! For 2018 onward, we will now have the addition of a BRAND NEW style of LED dance floor, which we hope you will love. You are probably familiar with the Starlit LED dance floors for hire that have been very popular at events, weddings and parties for many years. These floors have white LED lights inset into each panel, which twinkle in a set pattern. 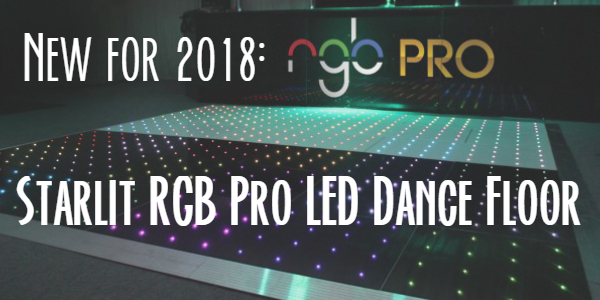 In order to offer you LED dance floor hire that is more versatile for event and party themes, we have invested in a new style – the Starlit RGB Pro Dance Floor. This floor has been manufactured in the UK to a high standard and uses a state of the art wireless controller. RGB stands for Red / Green / Blue, which are the 3 basic colours needed to achieve any visible colour on the spectrum. So rather than only have white LED lights, you will now have the freedom to choose from any colour imaginable. With a simple touch-screen control box, the Starlit RGB Pro LED Dance Floor allows you to set the LED lights to any colour. For example, you could choose a black dance floor with red lights for an Art Deco theme, or you could choose a white dance floor with blue lights for an Icy / Winter theme! To make it even more exciting, the lights can be set to either static or a preset pattern. Preset patterns include: twinkle, glow, disco squares, solid colours, wipes and much more. Ask us today about how this versatile dance floor could feature at your next event!